Another day another new indie brand to try. 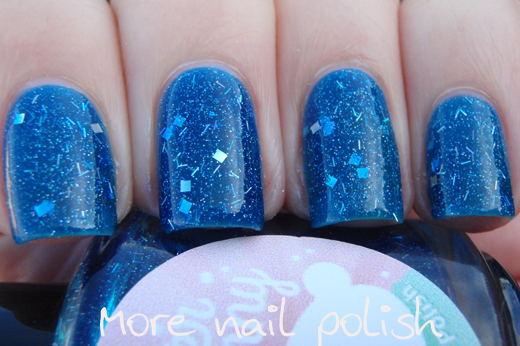 Today's new indie brand for me is GlitterBunny Polish! Based in Israel, it's exciting to see indie brands popping up in more and more countries around the world. 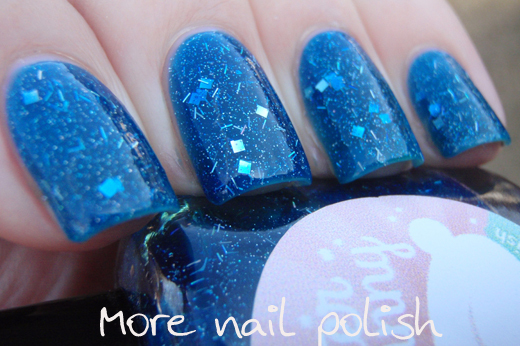 GlitterBunny polishes are 3 free and cruelty free and I have four shades to show you. 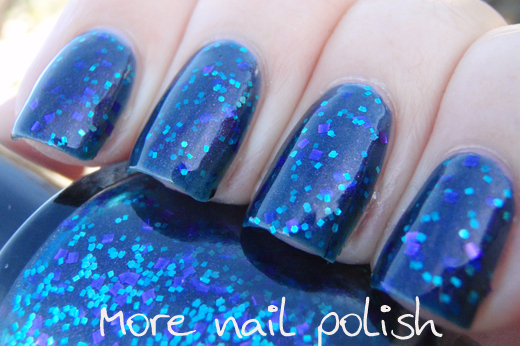 Heart of the Ocean - a blue jelly polish with silver holographic shimmer, tiny silver holographic bar glitter and silver holographic squares. It's always tricky for me to show you the gorgeous holographic sparkle on holo glitters, because I don't use a light box. I love taking photos of glitters in the shade, but then you can't see the sparkles. If you take photos in the sun, then usually the reflections flare too much. So just know that all the silver you see here, really does sparkle in holographic hues. This was two easy coats with Seche Vite top coat. I got a goodie bag - this is made up of various colours and sizes of square glitter in a clear base with tiny holographic glitter. 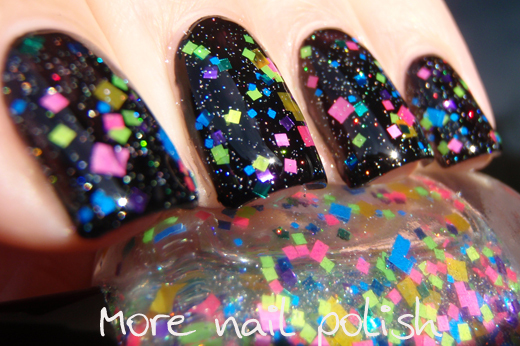 Some the the glitters and matte, and some are shiny, just all of the are super bright and really stand out over dark polish. 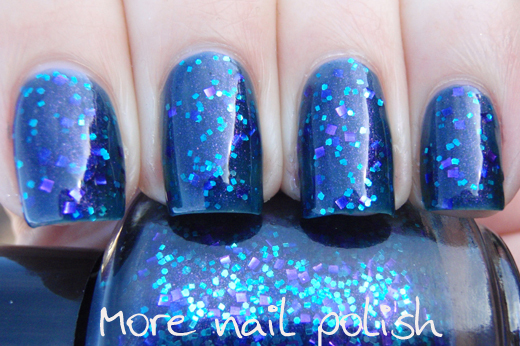 I particular love that this polish is only square glitters. This is two thin coats over black. I've got some nail art coming up with this polish layered over white too. Part of that World - A dark blue jelly base with small turquoise glitter and larger purple squares. The jelly base also has a purple shimmer than can easily be seen in direct light. This was two coats with Seche Vite, but I could have done three to increase the depth of the polish. 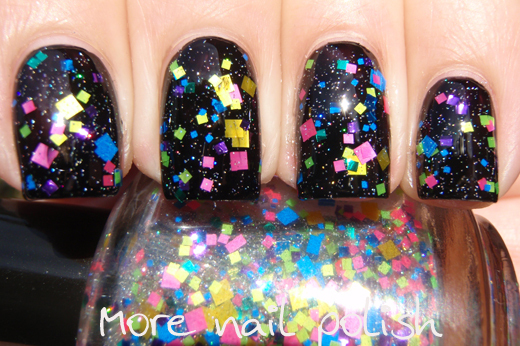 Rainbow Sprinkles - lots of different colours and sized of hex glitter in a clear base. 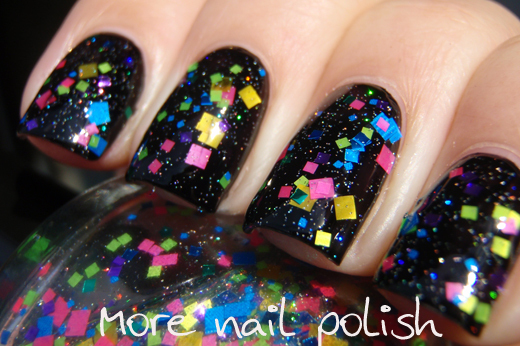 Not the most original name (I think I've seen several indie polishes with this name and a 'rainbow' of glitters), but that doesn't mean that I don't love it. The colours in this seem more primary colour based, with a predominance of red, yellow and green. The colours in I got a Goodie Bag are lighter and lean neon. I found this one a little thicker, but application was still very smooth and even. This was two coats over black with Seche Vite top coat. 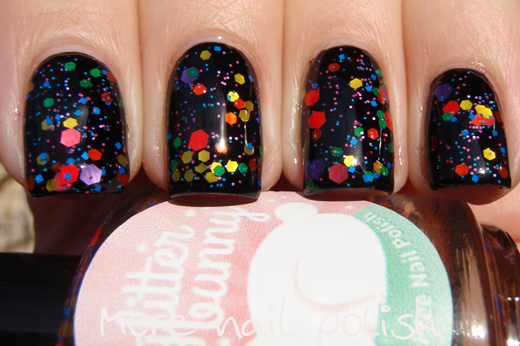 GlitterBunny polishes are available from their Big Cartel shop and cost $10 each. 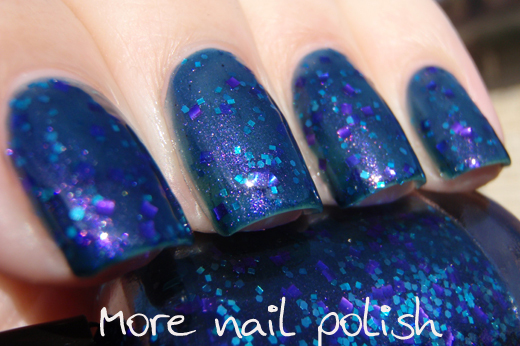 Updates on polishes are done through their Facebook page - so don't forget to like. 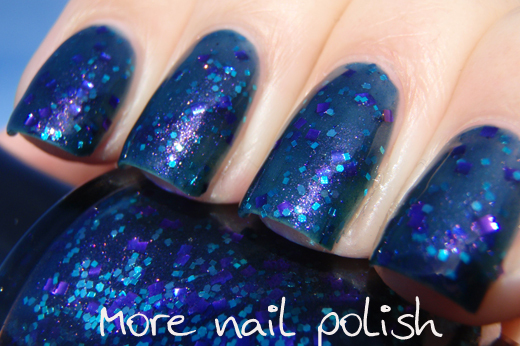 GlitterBunny do ship internationally and their international shipping rate is super good at just $4.50 per package (although I don't know how many polishes fit in a 'package'). The shipping time from Israel to Australia was very quick too, less that two weeks. I Got A Goodie Bag is my favorite, it's cute. I must admit that the first one totally stole my heart. It's gorgeous! love all of them! beautiful! Rainbow Sprinkles is a great one!